After five months, 150 days, and 266 games, we’ve finally arrived. Patriots. Eagles. Super Bowl 52. Consider this your one-stop shop for everything you need to know to bet the big game. Published articles: Ultimate guide to betting SB 52 … 52 picks for 52 props … Bales’ favorite SB 52 prop bets … Staff picks … Sharp sports book flooded with Pats money … Best SB 52 halftime show props … Everything to know about SB props … How to bet cross-sport props … Should you bet on the better QB? … SB halftime betting strategy … The complete gambling history of the Super Bowl … Does extra prep week matter? … and more! Must-see: FantasyLabs player props tool … Props sweepstakes: Win a 50-inch TV! Where to watch us on Super Sunday: Be sure to tune in for our Super Bowl live stream! Our crew of experts will break down all the angles for Patriots-Eagles: Metrics, props, trends, injuries, ref insights, DFS nuggets, sneaky storylines, matchups to watch, biggest advantages (for both teams), and so much more. Our staff of experts picks out the 52 best props to bet for the big game. Props, totals, sides, and more: Our staff picks out their favorite personal plays for the big game. One sportsbook tested the waters at Patriots -4, but wiseguys pounced on New England at that number. Lauren Joffe has watched the film, scouted J.T.’s tendencies, and is ready to reveal her favorite halftime show props. John Ewing crunched the defensive numbers from both teams as well as past Super Bowls. Odds consultant Scott Cooley gives the bookmaker’s view on Super Bowl prop betting. Will Kyrie Irving score more points than the Patriots? We discuss that and 13 other intriguing weekend wagers. Matthew Freedman examines how important the quarterbacking edge been in previous Super Bowls. Everyone wants part of the action on Super Sunday, right? Will Al Michaels Make a Gambling Reference During The Game? Yes, you can actually bet on whether the NBC legend alludes to betting. The best way for savvy bettors to approach those second half lines. Biggest line moves. Lowest totals. Largest spread differentials. Favorites vs. Dogs. Overs vs. Unders. Evan Abrams details the Super Bowl’s best and worst from a gambling perspective. The best recipe for success at a Super Bowl party? Two words: Props contest. Since 2001, New England is 15-0 in the playoffs against teams they didn’t face earlier that season. Matthew Freedman looks at how the team has performed against Vegas expectations in games with at least an extra week of prep. Jonathan Bales breaks down the 12 prop bets he really likes on Super Bowl Sunday. The “Moose Tracker” goes back in time. John Ewing examines if decisive conference title game wins have been indicators of similar Super Bowl performances. Lauren Joffe isn’t a bookmaker, but if she was, you’d have some interesting props to bet on. Does this crew’s past results project anything for Eagles-Pats? Public money on New England in the title game hasn’t been this low since Super Bowl 42. Here are the initial limits with less than two weeks until the big game. Just how important is Rob Gronkowski to New England’s chances of beating the Eagles? The Patriots have allowed the third-highest percentage of points via the pass, which is good news for Nick Foles & Co.
How do Tom Brady & Co. match up against the Eagles’ defense? 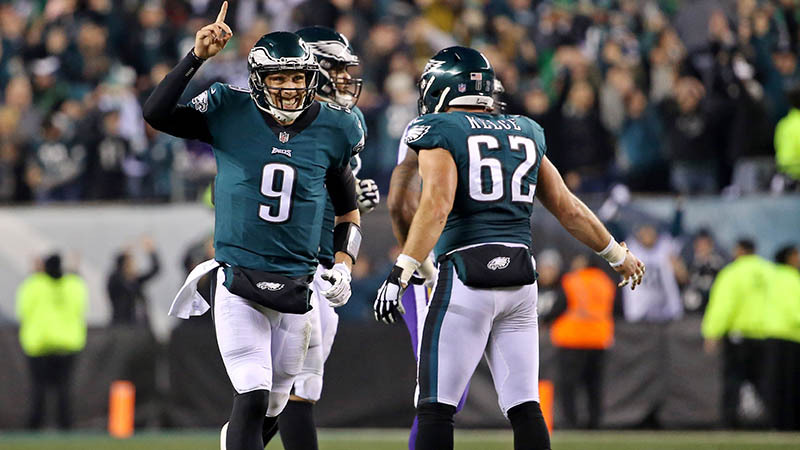 Where can Nick Foles attack the Patriots? Stuckey handicaps every matchup in Super Bowl 52. The public perception of Gronk’s importance makes him one of the most valuable non-QBs in the league. But should that be the case? Foles isn’t Wentz, but in the aggregate, the Eagles have outperformed their Vegas expectations with him almost as much as with Wentz. Vegas local Matt Perrault plans the ultimate Super Bowl weekend for those lucky enough to be heading to Sin City for the festivities. Featuring Barstool Sports personality Big Cat, former NFL lineman Geoff Schwartz, Chad Millman and other members of The Action Network team, our live stream show will air on our Twitter handle pregame (5 p.m. ET), at halftime, and postgame and will cover all the bets and props.